Roma’s slick rubber rain boots aren’t your typical puddle-stompers. Fairly made in China from 100 percent natural latex rubber, each $84 boot includes a lining of quick-drying cotton to keep your toes nice and toasty, plus a multilayer cushioned insole for splashing around in comfort. Even better? For every purchase, Roma donates a pair of galoshes to a child in need. We’re hooking up one lucky reader with a pair of boots to call your own, in your choice of size, color, and finish (choices include gloss plum, gloss navy, matte brown, matte gray, and matte taupe). Enter now to win! 2. LEAVE A COMMENT BY JUNE 4 and tell us your favorite rainy-day activity. Although it doesn’t hurt to get fancy, we’ll be picking a winner at random. We’ll announce the winner in our newsletter on Wednesday, June 5. The deadline to enter is 12 midnight ET on Tuesday, June 4, so ENTER NOW for a chance to win! Roma Boots is a “buy one, give one” fashionable rain-boot company headquartered in Dallas, Texas. It was founded in 2010 by Romania-born Samuel Bistrian who wanted to help children in his home country by combining his love of fashion with charity. For every pair of Roma Boots sold, a brand new pair is donated to a child in need. Additionally, 10 percent of all proceeds go to the Roma For All Foundation to help these children break out of their cycle of poverty so that they can contribute their gifts to society and help make this world a better place. On a rainy day, I love making a good cup of herbal tea, sit in my favorite chair and write poetry in my journal. I have been shopping around for boots and these are top on my list. I love catching up on jewelry making to gift to my loved ones on a chilly, rainy day. ? I normally prefer to stay inside and read a book on rainy days since I don't like to get my feet wet. However, with an new pair of Roma rain boots, I will enjoy stomping where I normally wouldn't, and think of that lucky kid that will also enjoy the childhood pleasure of making ripples in puddles and that feeling that anything is possible :). I agree with the comment above. I like to stay inside because I don't like to get my feet wet (I'm part cat). But that's why I would love to win a pair of Roma boots. They would probably get me out of the house on a rainy day, while usually I prefer to sit inside and cuddle up with a warm blanket (and my cats) and some hot tea. I have honestly been wanting a pair of these boots for a super long time! I love what they are doing for children in need. I can't think of anything more useful to gift to a child. Imagine how happy they will be splashing in the rain in their new boots! I hate it when the bottom of my pants get wet!!! I hope this is where I'm supposed to leave my message, Loll. Playing outside in the rain is better than playing in the snow. Sure you can't make a snowball but you don't freeze either! But of course nothing beats kissing your love in the rain!!!! I'm a stay inside kinda person for rainy days, but I love opening a window to listen!! My current rain boots have holes, which isn't very helpful in the rain! I grow fruit trees, berry bushes, currants and grapes in my garden, along with vegetables and herbs. I couldn't find a pair of boots that fit my muscular calves, so I ended up getting some ugly raspberry boots from a feed store up North...they were my first pair of gardening boots and are stiff and very uncomfortable! But since I have heavy clay in my yard, they have really gotten a lot of use, especially since I use a broadfork which puts you deep in the dirt. I would love to try these since they are made from all natural rubber...maybe I won't get a red ring around my calves after wearing them? Thank you! On a cool, rainy day, I love to sit inside and watch the rain through the sliding glass doors, read a good book or watch a movie and sip flavored coffee. Here in FL, most rainy days are hot and muggy. We can't stay in when it rains because otherwise nothing would get done. With rainboots, I wouldn't worry about the rain and puddles so much! I live in Hawaii and we gets rains like you wouldn't believe!! humbling,pounding rains!We can't go sledding here but my kids often take out skim boards and boogie boards to slide down the hills in the rain. I love to go running on a rainy day; almost no one else is out, and it feels like I own the world. When it rains there's nothing better than staying home and watch a good movie or listen to a good music album! I love to cook something hot and steamy--like gumbo or something. Take all day to putter around and cook it up whilst listening to the storm/rain. I love listening to the rain on the roof. Hope to win the boots! Weeding is easier in a light rain or heavy mist. my favorite rainy-day activity is watching movies! Take a nap lullabied by the rain. I love being outside in the rain. A soft drizzle during the summer is a nice respite from the scorching heat for a run. I feel like a champion running for pleasure while others drive by on their way somewhere indoors. When I am not out splashing in puddles with my grandsons, you can usually find me inside enjoying a good book or magazine. making tea and playing board games with my family and friends. on raining days i love going kayaking! weird i know, i love water! Favorite Activity on a rainy day is, by far, planting seeds indoors to grow for my p-patch. My favorite rainy day activity is to go for a walk when it's raining softly and see how the world looks through a softer lense. I love walking outside when the rain is just a drizzle. The streets are quiet and when I take the dog, she makes me laugh as she tries to catch "bubbles" forming in puddles. Obviously, good rainboots are required for this, and my current pair cracked a few months back. I am looking for a new pair! Indoors: vegan baking. Outdoors: walking the dogs, who in true Los Angeles style, don't understand why this stuff is falling from the sky and generally see rain as an excuse to pee in the house. I love to go walk in the rain! I love to walk in the rain. The air is washed fresh, the moisture feels great on my skin and add a curl to my hair. The grass and tree are all perky having just been nourished by the rain. Window shopping is great in the rain. Everything seems to look better from under and umbrella! I am always glad to come across great vegan companies. rain boots have been tricky for me, because, although I often enjoy walks, hikes, and gardening in the rain/ or post rain (I am a rain person); the feel of rainboots in general seem claustrophobic to me, thus creating that nagging feeling that I should cut my walks shorter to go inside and take them off and have human feet again. the snug lining to these boots may well be what I need to feel comfy and barefoot during my 'rain time'. whenever I play the part of a consumer, my concerns are not only that an item is vegan and cruelty free, but that I am funding ethical companies and practices that do not exploit non human animals, humans (fair trade, not toxic or harmful to/ allowing a truly fulfilling life for the workers, not toxic to consumers, does not pollute the local environment creating a landscape of trash mountains, unsafe air and water), and the environment (preferably closed-loop, low impact life cycle analysis, purchasing carbon offsets, made using ethically and truly sustainably gathered plant fibers.) In addition to 'do no harm', I am glad to see and support 'do good' businesses/companies/NGOs/non profits, who use their endeavors to benefit the vulnerable among us. this is the first time that I'v heard about Roma Boots and LOVE LOVE LOVE that an ethical rainboot company is donating rainboots to children in impoverished nations. LIGHTBULB MOMENT- think about it. where does our trash go when we throw it away? where is 'away'? which places have poor sewage and sanitation? where are people suffering and dying due to preventable bacterial diseases? waste and toxins from more developed nations are shipped to impoverished parts of the world, creating biohazards conditions. yet the people, the children here are forced to live, play, work, survive amongst these landscapes; often barefoot. When I grow up, I intend to be a solutionary and get humans and non humans out of harmful environments. children shouldn't be in unsafe environs at all. though while we are working towards this, providing durable barriers between someone and the ground (through protective footwear) seems the most effective way to prevent the disease, suffering, discomfort, and so much more, that innumerable little souls face every day. living in such a landscape, I would rather keep my feet clean, than walk amongst sewage, uneven terrain, glass cutting my feet; with little access to clean water to wash; then after a long time of discomfort and suffering, maybe maybe have access to minimal healthcare. so glad to know that, amidst all the bad, there is good out there. my fave rainy day activity is to do some reading beside a window and listen to the rain fall -- ty for the chance! I am a subscriber and I love staying inside and being with those I love during rain storms however reality is that you usually have to get out in the rain. It is nice to have stylish and efficient rain gear for those times. Reading is my favorite rainy day activity. As long as it's not raining too hard I like to sit on my porch and watch the rain come down, usually with a book in my hand. My favorite rainy-day activity is sitting in a comfy chair and reading a book. I live in the state where it rains the most in our country. I need these rain boots! Also, I simply love rain boots. On a rainy day, I love to carry the rain's springtime freshness with me by wearing something green. I love to take a short walk, get a little damp, then hide under the warmth of a blanket with a cup of tea, somewhere I can hear the tap-tap-tapping of the passing storm. Besides cuddling, I also enjoy splashing and jumppiling on water puddles. On a rayiny day I like to curl up on the couch with a good book, or cook something comforting. Curling up with a good book and a warm cup of jasmine tea...:) Or painting. I love to sit on my hammock on my (covered) porch and listen to the rain. Curling up in bed with my rescued dogs and cats while devouring an excellent book is an ideal rainy day. When you live in Seattle you have to have a lot of rainy day plans. My favorite is to go to the Woodland Park Zoo... there are plenty of sheltered spots, the animals don't seem to mind and the crowds are pretty minimal. If the rain is refreshing, I love walking in the park... if not, then hot tea, snacks and a good book are welcome friends. I love to go for walks or read by an open window. Listening to classical music and reading a good book, but maybe some new boots would energize me to venture outdoors! I love to sit by the window and listen to the rain pitter patter on the windows. I like to watch thunderstorms from indoors. I love to go to my favorite cafe and sit with my journal looking out the window at the world going by. My favorite rain activity is to stay at home, watch movies and make hot chocolate. My favorite rainy day activity is going to the movies! These boots look like they work pretty well. I am working on an organic diary farm and could really use a pair of these. I have been traveling all over the country working on sustainable projects and money is very tight as we rebuild after the current bogus economy. If I could afford to buy a pair I would. I'd love to have such cute boots. When I was growing up the rain boots were really dorky. My favorite rainy day activity is catching up on research for my vegan novel. Thunder, lightning and writing about my quintessential vegan man, all draped in animal rights, an animal sanctuary, and plenty of comedy and drama. I hide out in my studio with the doors open and enjoy the inspiration that the misty day brings. If it is only a light sprinkle I take a break and walk to my favorite coffee shop for a cup of joe. I like walking to the lake reservoir and watching the waterfall. They look like the perfect pair of boots to go walking under the rain, wich I love doing, and the fact that they're vegan it just makes them even more perfect! On a rainy day I like to put on a big pot of soup, sit on the front porch with a glass of wine and some Miles Davis and just listen. This is one thing I don't have, a good pair of rain boots. I would use them constantly...walking the dog (especially on rain days when the road is a muddy mess) and working in our vegetable garden. stomping in every puddle I can, then curl up with a good book & a cup of coffee. I love to sit and watch it storm if it's a big storm. If it's just rainy I sleep really well and want to just sit and cuddly with my cats and watch movies. I've always wanted to own a pair of rain boots. When I was a kid, my parents' idea of rain boots were a pair of cowboy boots. I love to read books and write in my journals when it's rainy. But, I have two small kids so that doesn't happen anymore. So I settle for taking the kids to an empty parking lot and letting them splash their hearts out. And maybe when they're passed out napping I can read a book or write in a journal...or take a nap myself. love sitting around watching a good movie while its raining. its so relaxing. Mine is to play board games or have an indoor picnic with my kids. I work outdoors, so I'm not afraid to get a little wet. When I'm being playful I like stomping in the puddles. I love the smell of the first rain! Walking along the waterfront (ocean, bay, river). Splashing around on the beach. I love putting in an old movie and just watching the rain outside. If the rain won't go away, at least there's good boots. I'm happiest when it's raining! These boots would make a walk in the rain all the more delightful! It won't stop raining in MN...garden is getting mes-SY!! My old boats are worn through, I've been using old running shoes, that's gross too. Fingers crossed! Splashing in puddles! Dancing in the rain with someone fun! Or watching the lightening and listening to the raindrops while snuggling and drinking hot yummy drinks and reading or napping. Also, I really need some rain boots in a bad way. I love spending Saturday mornings in the garden after it rains then lounging in the back yard with a cup of tea. For warm rains, I love standing or laying in my hammock, closing my eyes, and letting the rain wash over me. I feel it softly hit my skin, run down my skin, or pool on my clothes. It feels like my soul is washed clean. For cold rains, I stay inside and play board games, but open a window so I can hear it pitter-patter outside. On rainy days, I love to go out hiking through the woods. I love playing in the rain! I love sitting inside during a rainy day and just sipping tea and reading. :) These boots would help me walk to my favorite cafe so I can indulge in my favorite activity! On a rainy day, I like to sit on a covered porch, watching the rain fall, feeling the mist on my face, and smelling that fresh rain smell. Rainy days are a free pass to be lazy. I can guiltlessly do nothing. it's great. Hello, MY favorite rainy day activity is staying inside with hot tea and soup. Thanks for the Giveaway. On rainy days, I love to bake. I especially love baking oatmeal raisin cookies during thunderstorms. It reminds me of when I used to bake them with my mom when the power went out because of the storm. I love to get wet on a rainy day- especially in summer! Go out and get soaked! Then come in, laugh at the puddle I make on the floor, put the wet things in the tub, put dry things on, and knit. If it's safe and I don't have somewhere to be, I like being in the rain. If it's cold or lightning/thundering, then I like going to the dollar movie theater nearby. a poem in praise of spring, mud, childhood and more by e e Cummings: in just- in Just- Spring-- when the world is mud-luscious-- the little lame balloonman whistles far and wee... and eddie and bill come running from marbles and piracies and it's Spring-- when the world is puddle-wonderful! I like to curl up on the couch with a good book on a rainy day! I love mucking about in the rain--this means splashing in puddles and running through open spaces. But, walking is a joy too, face turned towards the Sky, watching the drops dancing down upon the Earth, leaving all clean and proper. Being near a lake or ocean is great fun as well, especially when the thunder and lightening come to call! There is nothing about rain that is not joyous and it always calls out for me to come take a walk. Sitting on the deck under the awning during a downpour & watching the spectacular lightning display! On a rainy day, I love to snuggle up and watch a movie, or bake. I always like to bake. Ideally, I'll be at the beach! Then I get a water-squared moment .... rain & sea :) I'd walk in the surf, check out the raindrop marks on the sand (they look like abstract art), find newly cleansed shells. Sometimes a neighbor brings their dog who loves to run in the rain and eat raindrops! If it's raining hard during a full moon, the tide can get really high. Then I'd need those Roma rain boots to keep my feet clean and dry while I run for the dunes! The last I do when it rains is stay indoors. I love getting wet in the rain. I'll grab my rain boots, my clear bubble umbrella and go out- anywhere! When I get back home, I'll make myself a latt�, and cuddle with my tiny dog. the smell of rain and the sound of rain, are my favorite things. My favorite rainy day activity is full on entertainment. One movie after another and video games, along with a bowl of popcorn and hotsauce. Yum! On a rainy day, i love to take a trekking in the reserve forest ! In Monsoon, its an experience with the nature, really unexplained in words... it is to be felt ! Jumping in puddles of course! Rainy days I often take my son to the library, although on occasion we go outside and splash in puddles and get ourselves good and messy. :) These boots would certainly come in handy for that! on rainy days I really enjoy having a grilled cheese sandwich with a cup of tomato soup paired with a great movie. My favorite is to sit on my patio with a cup of coffee or tea and enjoy the rain as it falls. I love listening to it, watching it and smelling it. It refreshes me and forces me to slow down a bit. Hi, I like to garden in the rain, if it isn't pouring. I like taking my toddler outside to splash in puddles! ...and this, even though neither of us has rain boots! When it's rainy I love to be out in the garden pulling weeds and planting, it's the best time for those activities! You get pretty muddy but it's okay, the rain washes you:) Thanks for the opportunity! Because my boys play soccer, I've spent a lot of rainy days getting soaked while watching or coaching their games. I love to stay inside and watch a good movie! LEAVE A COMMENT BY JUNE 4 and tell us your favorite rainy-day activity. I love to knit on rainy days. The best: curl up in a corner and read. On rainy day I sometimes just like to go out on t-shirt and just get some prana from the rain. i live in the rainforest, key word RAIN. how lovely to splash around in puddles on a regular basis! Depends...if it's raining really hard, then I like to spend the time baking and doing some digital processing of photographs. If it's not raining too hard, it's a great time for weeding the garden (if it's summer) or going for a walk to the neighbourhood coffee shop. I love walking in puddles. 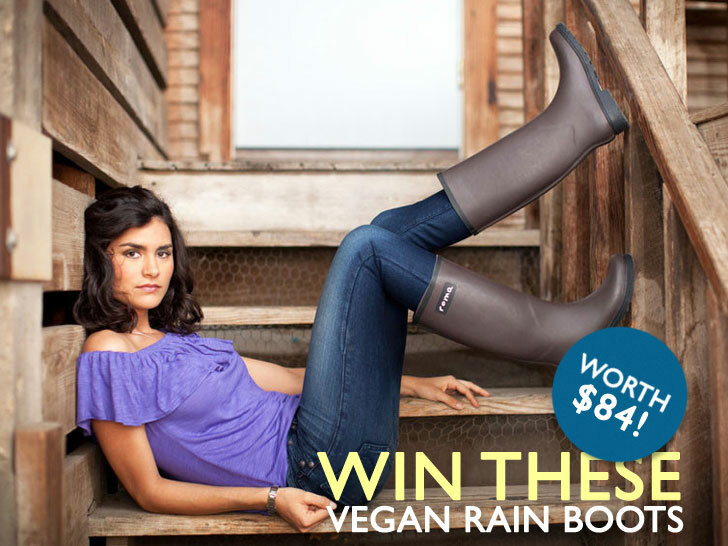 That is why I want to win a pair of these awesome rain boots. i love to take a walk in the rain! Roma's slick rubber rain boots aren't your typical puddle-stompers. Fairly made in China from 100 percent natural latex rubber, each $84 boot includes a lining of quick-drying cotton to keep your toes nice and toasty, plus a multilayer cushioned insole for splashing around in comfort. Even better? For every purchase, Roma donates a pair of galoshes to a child in need. We�re hooking up one lucky reader with a pair of boots to call your own, in your choice of size, color, and finish (choices include gloss plum, gloss navy, matte brown, matte gray, and matte taupe). Enter now to win!